The most causes of accidents is to be ignored by other road users ! MotoBozzo-Switch, cables, clamps, mounting material, and mounting instructions. We use the existing light flashers switch for the MotoBozzo-Switch. So there is no fishing for an additional switch located who-knows-where. Additionally, you get the security of keeping both hands on the grips when turning on and off. After starting the engine the lights switch on automatically, now the lights can switch off or on by flasher switch with two trigger ( click click ). So don’t need no additional switch for the lights! reconnected one prepared wire, very simple! The provided wiring harness is prefabricated for, expediting and simplifying the installation process. In real terms, that means that only 4 cables need to be attached. You will be enthusiastic about the quality of this light set! Our kit includes the MotoBozzo-Switch – for switch-less mounting! Auxiliary lights were never before so simple! After the installation you will say that you are substantially better seen in daylight and therefore drive more securely. 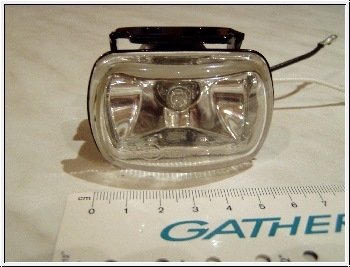 Starting from the front tire, the road and the surrounding area are better illuminated. The set includet the special H3 12 V 35 Watt bulbs! The bulbs takes only 70 Watts of total output from the generator. This Product was added to our catalogue on Thursday 29 November, 2012.